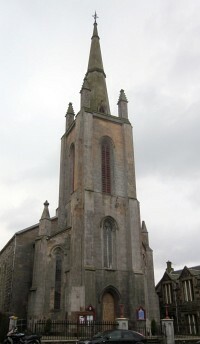 Designed by the celebrated Aberdeen architect Archibald Simpson (1790–1847), this Gothic Revival church with a prominent tower and spire opened in 1845 as Rothesay Free Parish Church. In 1907 the roof collapsed. It was replaced by Honeyman, Keppie & Mackintosh with a new hammerbeam roof with Gothic details. At the same time, a wrought-iron finial was added to the spire. Authorship: John Keppie was responsible for the work carried out in 1907. His name, and not the practice name of Honeyman, Keppie & Mackintosh, appears in the minutes of the Deacons' Court, which was responsible for overseeing the repair of the church. Alternative names: Rothesay Free Parish Church.